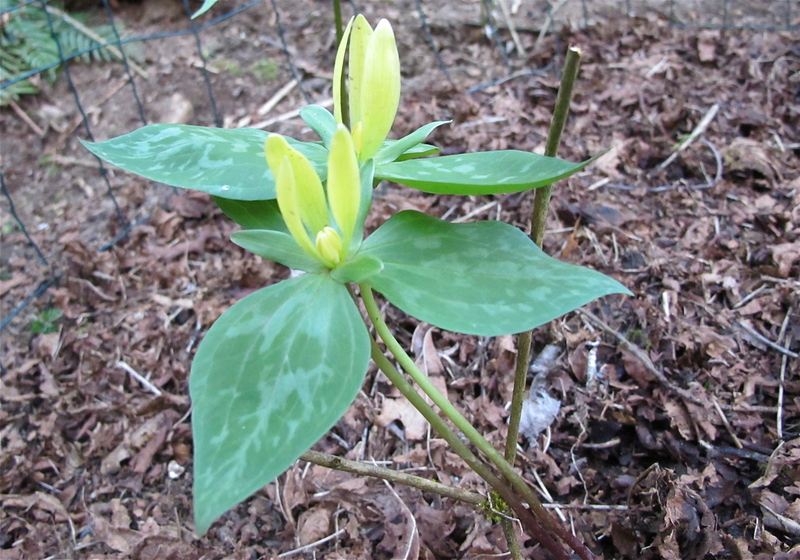 Western Trillium, T. Ovatum, is our native species. Trilliums are magical. That’s my perspective on them, because in the three plus decades I’ve lived on this particular spot of forested earth, they appear here one year, over there another year, sometimes one, sometimes two, once there was a magical circle of them hidden behind a huge rotting log. One might pop-up in the same place for several years, and then it’s gone. A new one might be sighted not far from the house, or deep in the woods. This time of year a walk on our trail is a Trillium search, looking to see if a familiar one has shown up, and hoping to discover new ones. I can walk by a particular spot many times, then suddenly one day there’s a Trillium there. 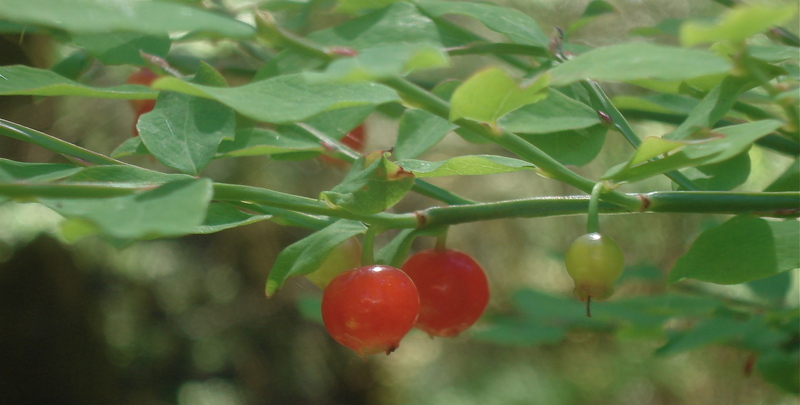 We do not have an abundance of them, their scarcity making them even more alluring. So in my way of thinking they are magical, akin to the fairies mentioned in my previous post. This is what Susie sees out her front window. 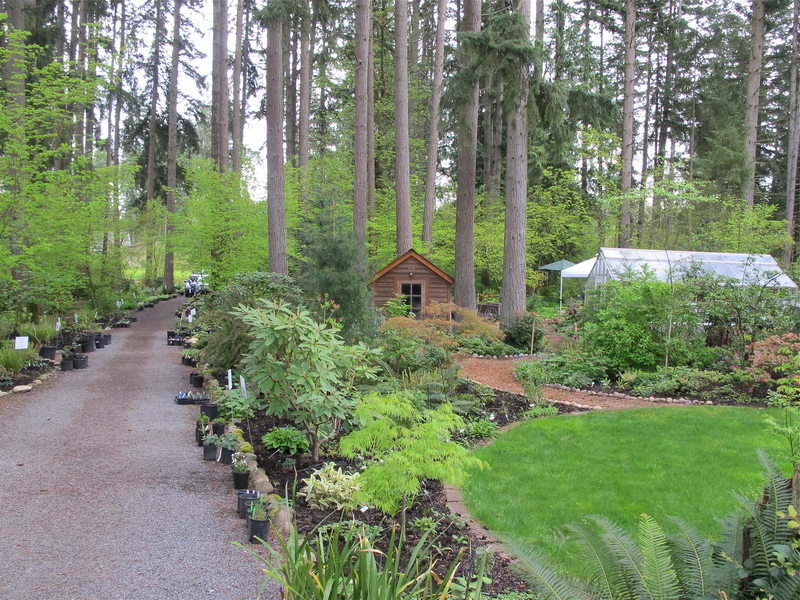 On this day the drive is lined with plants from her plant sale. You can see the greenhouse and garden ‘shed’. 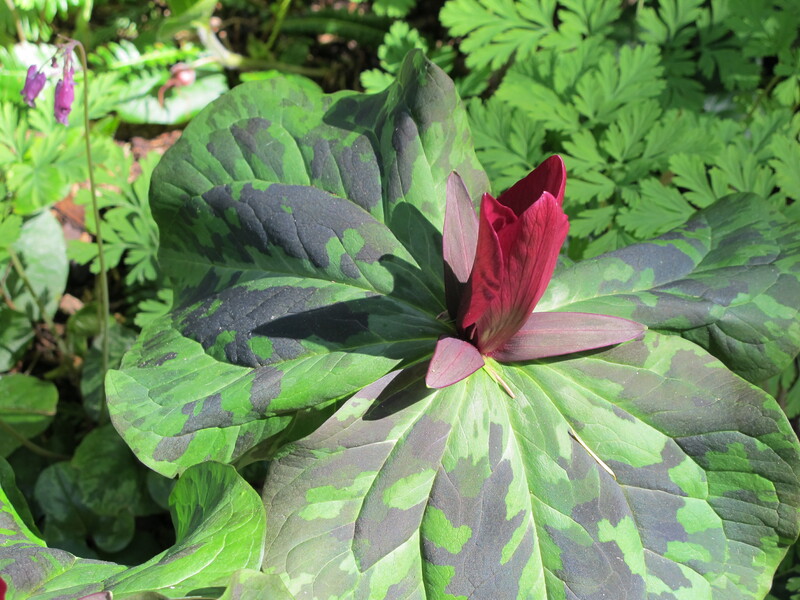 Around Valentine’s Day I posted on facebook a striking red Trillium with a variegated leaf, a picture taken at Bloedel Reserve last spring. I also added a card to my Huckleberry Card collection using the same image. It generated lots of ohs and ahs. 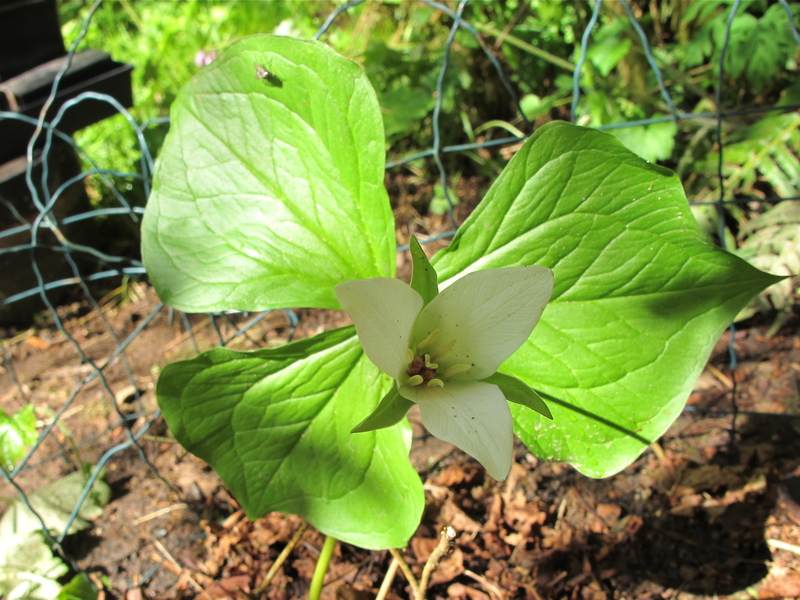 In my search to find more information about it I discovered in Washington, Woodinville to be exact, a self-proclaimed “Johnny-Appleseed” of Trilliums. Susie Egan’s front yard is Cottage Lake Gardens, a lovely, tall timbered mini forest with garden beds brimming with native shade plants such as false-lily-of-the-valley, oxalis, and false-solomon-seal. 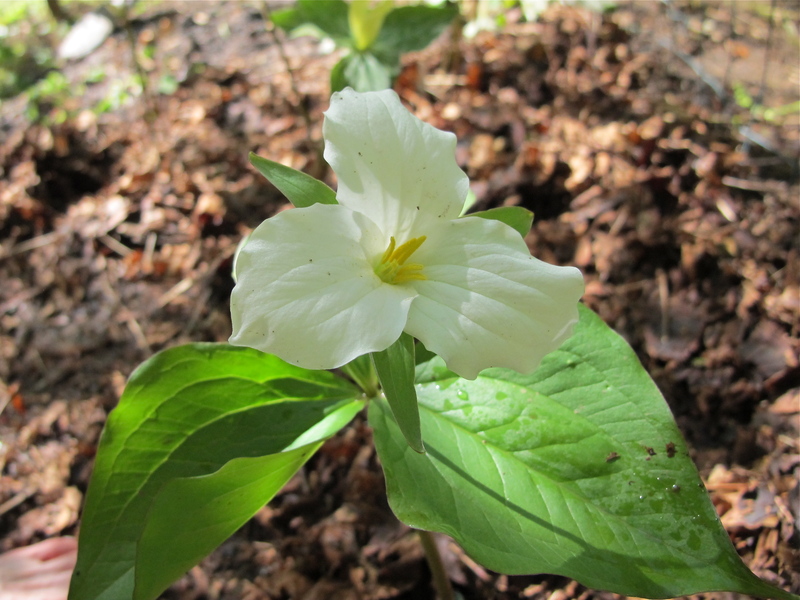 Poking up in these islands of lush green are 45 different species of Trilliums. Susie says there are 47 known species worldwide, an Internet search brings up differing numbers, but Susie is now my Trillium mentor and I’ll go with her numbers. For a passionate Trillium grower and promoter, this is a busy time of year. 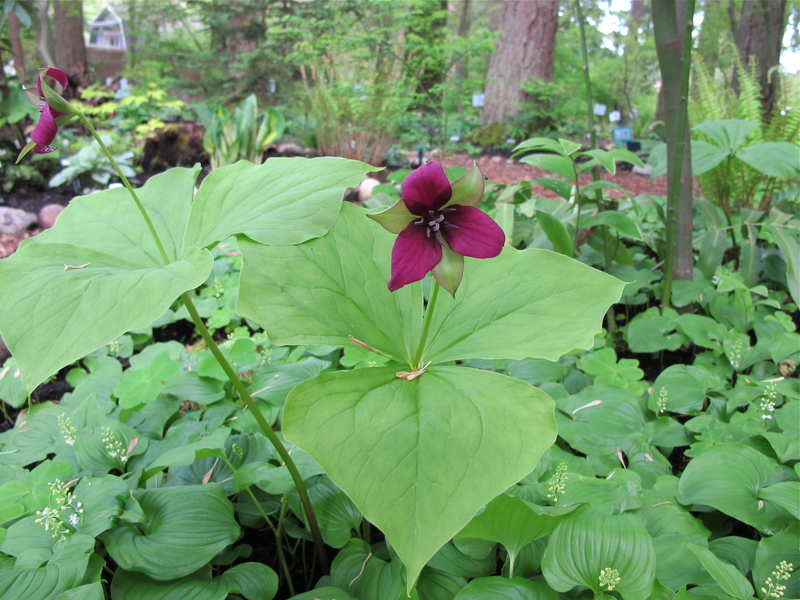 With prior arrangements, garden clubs, Master Gardeners, any small group of folks, may walk through Susie’s enchanting garden and learn about Trilliums and other shade plants from an enthusiastic, very nice, and very knowledgeable garden-host. Last weekend Susie had a two-hour sale, people lined up to buy a variety of shade plants, including many Trilliums. 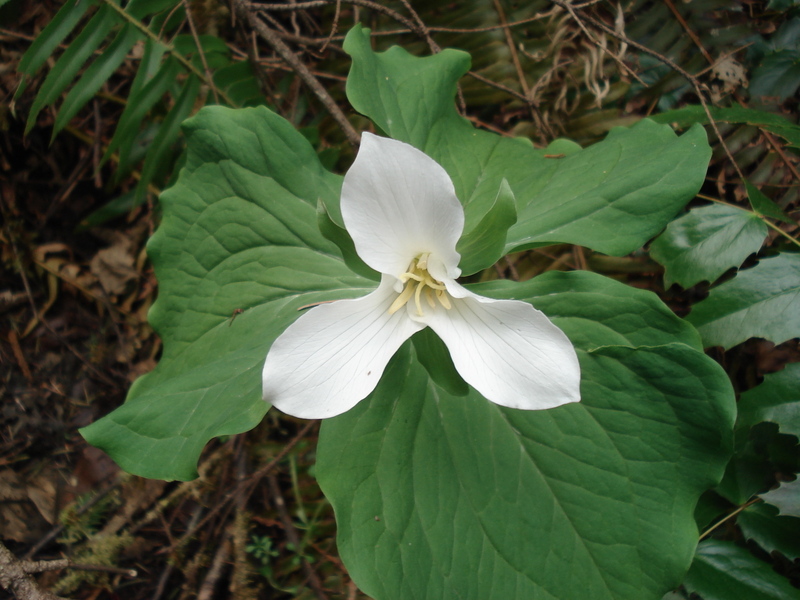 On Mother’s Day there is a “Trillium Tea, Talk & Tour of the Trillium Trail” open to the pubic. To attend you must pre-register. Besides the varying opinions on the number of species, there seems to be a difference of opinion on the botanical family Trilliums belong to. “Trilliums are rhizomatous herbs with unbranched stems. 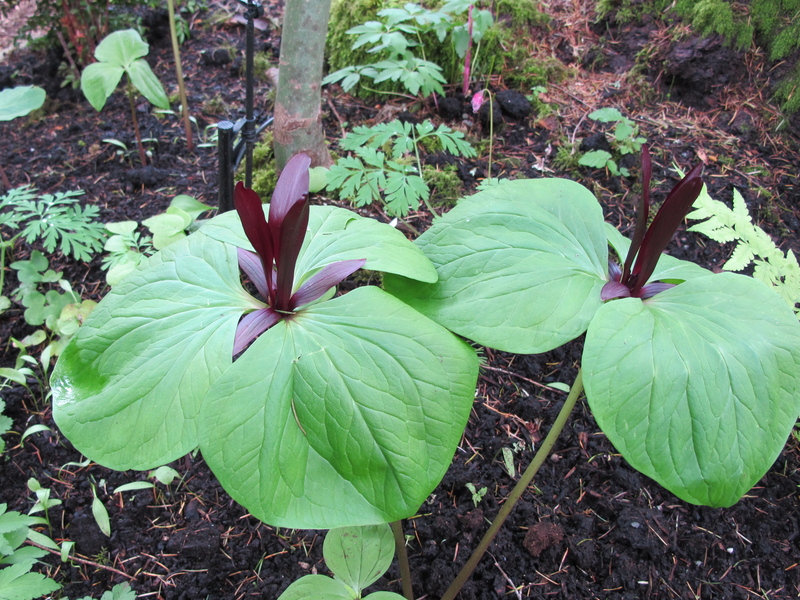 Trillium plants produce no true leaves or stems above ground. The “stem” is actually just an extension of the horizontal rhizome and produces small, scale-like leaves called cataphylls. These highly modified leaves surround the flowering scape (the above ground plant) as it pushes up through soil in early spring. The leaf-like structures are technically bracts subtending the flower. Despite their morphological origins, the bracts have external and internal structure similar to that of a leaf, function in photosynthesis, and most authors refer to them as leaves. at home in my new bed. That’s the science behind Trilliums. It is quite fascinating and adds to their mystery. However, as interesting as this botanical biography is, it is the charm of these seemingly delicate plants with their 3 broad “leaves” and solitary, exquisite, blooms, that enticed me to buy seven (six different species) to create my own Trillium garden. I have the shade, but our soil is iffy. After Mike added compost and bark, I planted Susie’s plants (I feel I adopted some of her children! ), tucking them in with leaf mulch. 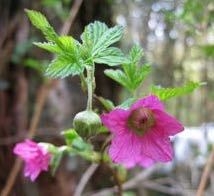 They look happy, and right at home, surrounded by rotting logs, Salmonberry, and under the shade of a sprawling Osier Dogwood. The Pacific Bulb Society has a great list of different species with good pictures and descriptions. More about Susie Egan: Besides her website, Susie has a Cottage Lake Gardens facebook page. 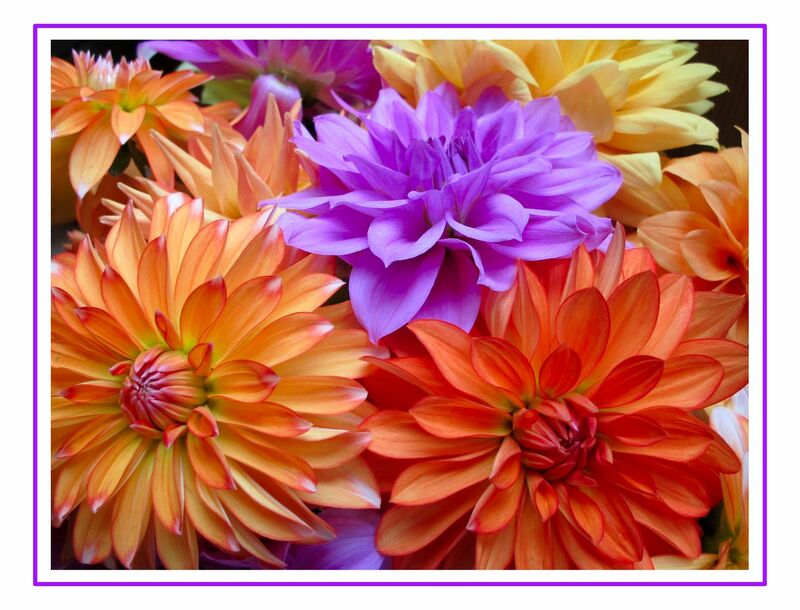 She gives talks on various garden subjects, including drip irrigation, winterizing the garden, and spring ephemerals. After visiting her garden I consider her the queen of shade gardening, and a very hard worker! She has a wealth of knowledge to share in any of her talks, or garden tours, even after the Trilliums are done blooming.